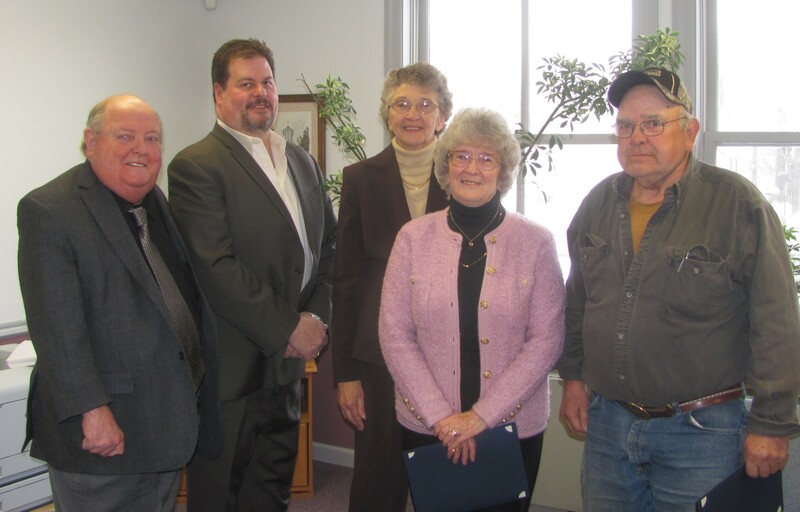 Wyoming County Commissioners (from left) Ron Williams, Tom Henry, and Judy Mead and the county’s election board honored (continuing from left) Janet Kristunas, Walter Reese and (not pictured) William Dodge for 50 years each of consecutive voting in local and national elections. 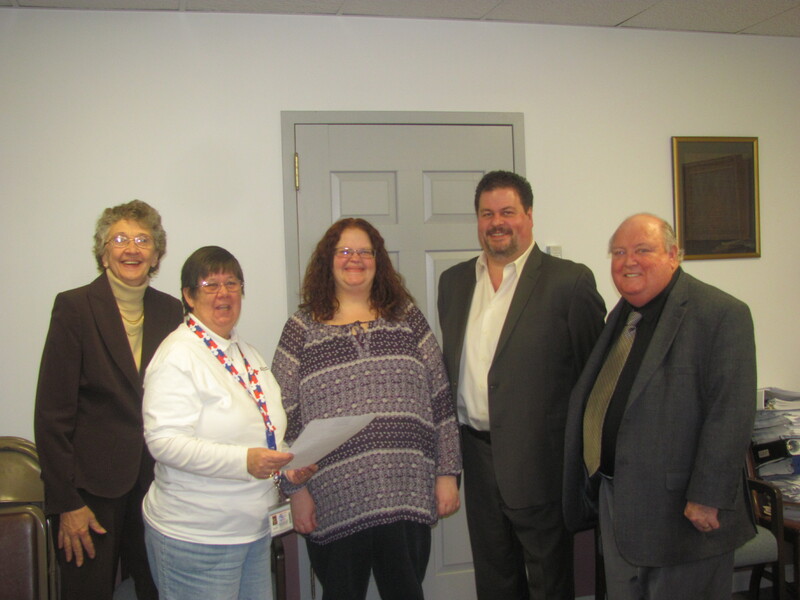 In a quick but action-packed meeting on Feb. 25, the Wyoming County Commissioners helped to kick of American Red Cross Month, bestowed some civic pride on three county residents who have impressive voting records, and discussed plans to provide area seniors with a new community center. 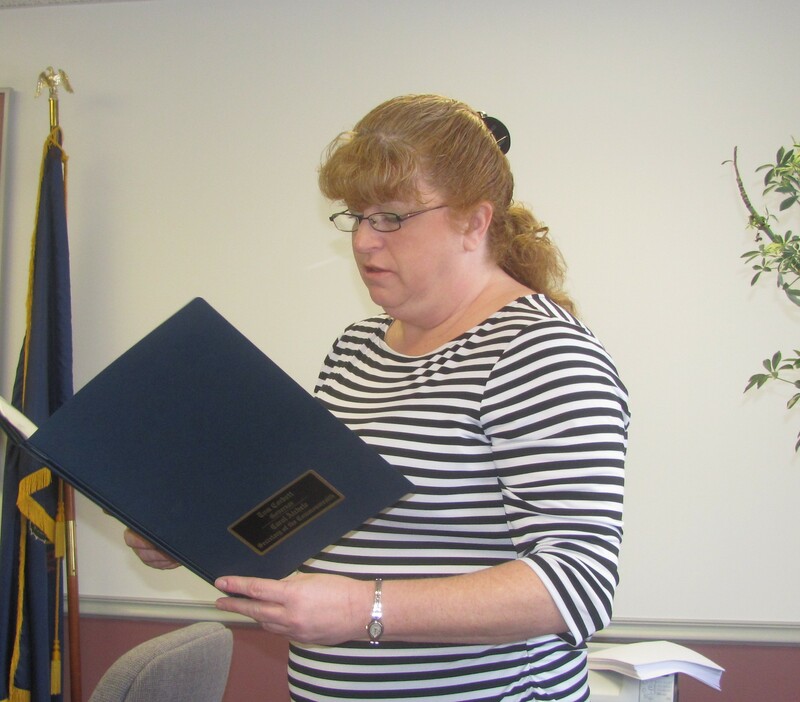 Wyoming County Director of Elections Florence Ball (above) read the proclamation acknowledging the 50-plus years that William Dodge, Janet Kristunas, and Walter Reese have been voting. Kristunas and Reese were in attendance top receive plaques signed by the commissioners. Regina Moyer and Kathie Bartron (above, center and second from left, respectively) represented the Susquehanna and Wyoming Counties Chapter of the American Red Cross (SWCRC) at the meeting. Commissioners Ron Williams was quick to point out that he developed a deep gratitude for the American Red Cross while he was in the service. Moyer, he added, had taught him CPR. Moyer, who serves as an office manager, said that she and new chapter director Terese DeLaPlaine have made it one of their primary goals to get more young people involved with the organization. DeLaPlaine was unable to attend, Moyer noted, because she was in conference with some school officials about the possibility of partnering on programs that would introduce teens to the many opportunities that the Red Cross offers for civic and social service. In 2012, for example, the SWCRC responded to 29 disasters that affected 30 families, assisted 22 local families with emergency communications between deployed military personnel and their loves ones at home, provided training and certification for more than a thousand people in skills as varied as CPR/AED and water safety to first aid and babysitter readiness. Williams was recently appointed to the board of the CEO/Weinberg Food Band in Wilkes-Barre. The agency partners with Wyoming and Susquehanna Counties and operates a number of food distribution locations in all three counties. The largest of these is to be moved to a new building near Pittston this year. Williams related that the new Weinberg Food Bank, which provides backup for the northern counties as needed, will be a much larger and more modern facility. Nonetheless, he related, donations made in Susquehanna and Wyoming Counties stay in the respective counties. One of the current priorities of the board is stocking up in advance to meet the needs of hundreds of children from low income families who will be home from school on summer recess and in need of food. Henry noted that he had met recently with Trula Hollywood, Executive Director of the Luzerne-Wyoming Counties Area Agency on Aging, who confirmed that Wyoming County would be the recipient of a $150,000 grant. The funds are earmarked for a new community center for local senior citizens. The grant can be used for a new building or for the renovation of an older structure offering at least 5,000 feet of accessible space. The commissioners agreed that the funds might go farther to cover the costs of retrofitting a structure than building something new. In news related to the Wyoming County Planning Commission, it was announced that the state’s Department on Community and Economic Development would provide matching funds for the overhaul of the county’s Comprehensive Plan. Henry related that County Planner Nicole Wootten would be working with the Wyoming County Chamber of Commerce on the project. The Comprehensive Plan was last updated in the 1990s, Solicitor James Davis explained, well before the arrival of the natural gas and wind energy companies. The Wyoming County Commissioners will meet again at 9 am on Tuesday, March 11, at the courthouse in Tunkhannock.